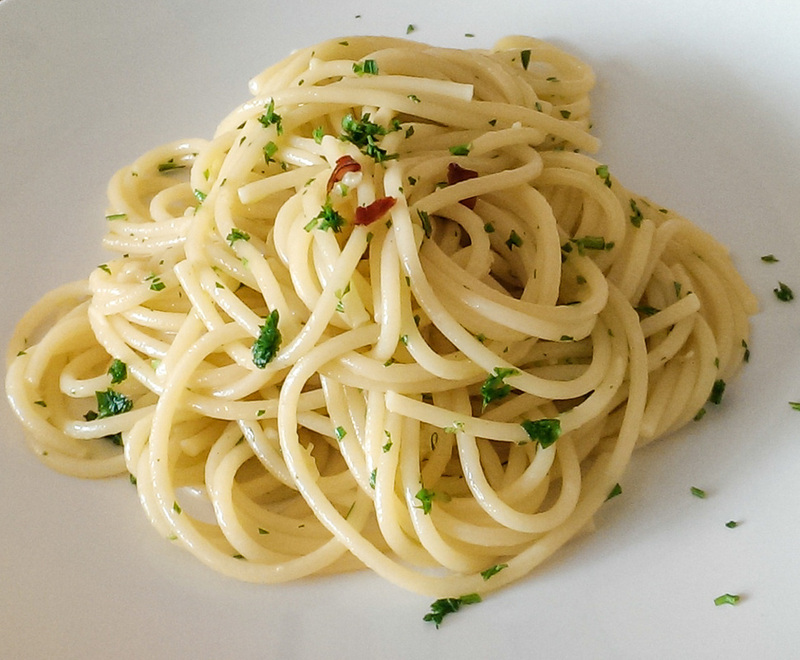 Introducing the simplest Italian dish: Spaghetti Aglio Olio Peperoncino. Finely chop the parsley and the garlic and slice the chilies. Heat two tbs of olive oil in a pan and then add the chopped garlic and the red chilies (quantity of chilies depends on how much you like spicy, although this dish should be piquant). Fry until garlic turns shiny (make sure NOT to burn it), then turn off the heat. Pour at least 1 liter of water in a stock pot and bring to boil. Once boiling add a scant handfull of coarse salt and throw in the spaghetti. Very important: follow the cooking time instructions written on the package, as pasta has to be al dente!! When spaghetti are done, drain the water well and toss them with the garlic and chili oil in the pan. Mix well and serve IMMEDIATELY with a sprinkle of fresh parsley.